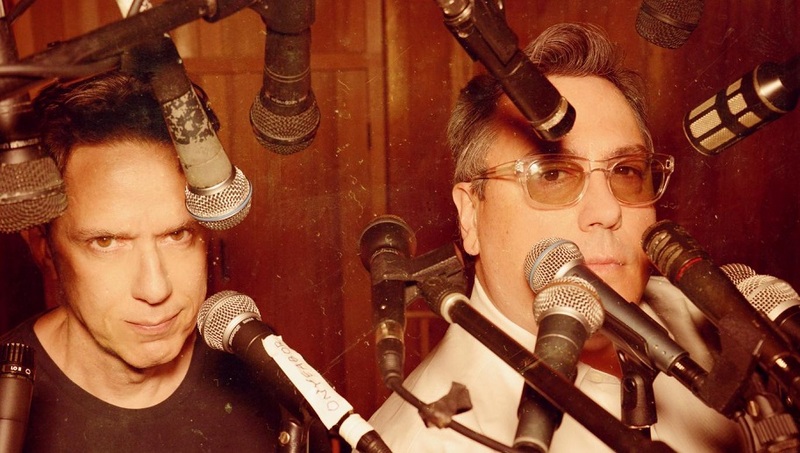 Brooklyn's ambassadors of love & purveyors of independent pop—They Might Be Giants, from left, John Linnell & John Flansburgh; press photo courtesy of the band. Never mind the civic shutdown hype, Impose’s Week in Pop brings you the brighter side of the wide world of progressive arts & artists. Bringing you some of of the latest breaking media exclusives, we first bring you some of the week’s top stories, such as Kanye & Kim Kardashian West celebrating the third addition to their family with the arrival of Chicago West; George Clinton dropped the new Parliament track “I’m Gon Make U Sick O’Me” ft. Scarface off the upcoming album Medicaid Fraud Dog; Drake dropped “God’s Plan” & Diplomatic Immunity” off Scary Hours; My Bloody Valentine announced their first show since 2013 with news of an appearance at Japan’s Sonicmania; Chicago’s CupcakKe’s dropped the video for “Duck Duck Goose” off the album Ephorize & announced a tour; Mount Eerie announced the new album Now Only available March 16 from Phil Elverum’s own imprint P.W. Elverum & Sun & dropped “Distortion”; Migos announced that Culture II will be available January 26 & Quavo dropped a preview; August Greene (Common, Robert Glasper & Karriem Riggins) dropped “Optimistic”; Young Thug dropped “MLK” ft. Trouble & Shad Da God in honor of Martin Luther King Jr. Day; Juicy J dropped “Got Em Like” ft. Wiz Khalifa & Lil Peep off the mixtape ShutDaFukUp; Hinds announced their second album I Don’t Run available April 6 via Mom + Pop & dropped their video for “New For You”; Mint Field’s debut album Pasar de las Luces will be available February 23 via Innovative Leisure & dropped the video for “Ojos En El Carro”; Teenage Wrist announced the debut album Chrome Neon Jesus available March 9 via Epitaph & dropped “Dweeb”; Fischerspooner dropped the Tom C J Brown video for “TopBrazil” off the album Sir available February 16 via Ultra; Beck dropped the Brook Linder video for “Fix Me”; ZGTO, Shigeto & ZelooperZ, dropped the short film A Piece of the Geto; Tinashe dropped the video for “No Drama” ft. Offset; Quality Control’s own Kollision dropped the mixtape Better Than Yesterday; Hanz dropped the video for “Plasty I” from the EP of the same name available now via Tri Angle; A$AP Ferg dropped “Family”; Amen Dunes dropped the Steven Brahms video for “Miki Dora” off Freedom available March 30 via Sacred Bones; XL Recordings boss Richard Russell announced the debut Everything Is Recorded album Everything Is Recorded by Richard Russell available February 16 via XL & dropped the video for “Bloodshot Red Eyes” ft. Infinite & Green Gartside; Sylvan Esso dropped the Dan Huiting, Kobamm Productions & Meow Wolf video for “PARAD(w/m)E”; Abra dropped “B.R.A.T.”; Parisian artist Uppermost dropped “Slide” ft. Yudimah off the new album Perseverance available March 23; Saintseneca dropped “The Wandering Star”; Jorja Smith dropped the video for “Let Me Down” ft. Stormzy; NBA collaborating with KITSUNÉ for the America 5 Music Compilation & North American Tour & dropped the IshDARR track “Glass”; Tee Grizzley & WeBuyGold collaborated on an episode of “Mr. Grizzley’s Magic Wraith”; Carnage & Lil Pump dropped “i Shyne”; The National dropped the Casey Reas video for “Walk It Back”; Montero dropped the Sean McAnulty video for “Running Race” featured off the album Performer available February 2 via Chapter Music; Kylie Minogue announced the new album Golden available April 6 & dropped “Dancing”; Yo La Tengo announced the new album There’s a Riot Going On available March 16 from Matador & dropped new songs; Hot Snakes’ new album Jericho Sirens will be available March 16 from Sub Pop & they dropped “Six Wave Hold-Down”; Shannon & The Clams dropped the Ryan Daniel Browne video for “Did You Love Me”; Phoenix dropped the Ti Amo demos; KUNZITE, Mike Stroud of Ratatat & Agustin of White Flight, dropped “Monks”; Ed Romanoff dropped the video for “Less Broken” off the album The Orphan King available February 23; The Soft Moon dropped “Choke”; VÉRITÉ dropped the video for “Saint”; CHAPPO announced the new album Do It produced by John Vanderslice at Tiny Telephone Recording available February 23 via Votiv Music & dropped “Cry On Me”; The Sea and Cake announced the new album Any Day available May 11 from Thrill Jockey dropped the title track; Pinky Pinky dropped the title track from their upcoming Hot Tears EP available on Valentine’s Day (February 14); Mouse On Mars dropped “Dimensional People Part III” ft. Justin Vernon; DATAROCK dropped “Laugh in the Face of Darkness”; Haich dropped the Unbalanced EP via Stem; Of Montreal announced the new album White is Relic/Irrealis Mood available March 9 from Polyvinyl & dropped “Paranoiac Intervals/Body Dysmorphia”; Mahogany LOX dropped the lyric video for “It Is What It Is”; Moon Taxi dropped “Not Too Late” off their just released album Let the Record Play; Synapson dropped the Mary Clerté video for “Hide Away” ft. Holly; Zeal & Ardor dropped “Baphomet”; Bleachers dropped “Alfie’s Song (Not So Typical Love Song)”; EELS announced the new album The Deconstruction available April 6 via E Works/PIAS & dropped the title track; U2 dropped the Broken Fingaz Crew video for “Get Out of Your Own Way”; Grand Analog dropped the visual for “Mutations” ft. Posdnuos of De La Soul; Preoccupations announced the new album New Material available March 23 via Jagjaguwar & dropped “Espionage”; The Decemberists announced the new album I’ll Be Your Girl available March 16 dropped “Severed”; MGMT’s new album Little Dark Age will be available February 9 via Columbia followed by an upcoming tour; Crumb announced spring tour including SXSW & dates with Combo Chimbita; Alvvays announced a spring tour; Jack White announced tour; Fleet Foxes announced tour dates; Karin Dreijer of Fever Ray to embark upon a North American tour; Afghan Whigs & Built to Spill announced a joint tour; The National announced tour dates with Big Thief; Deerhoof to be the guest curator for Calgary’s Sled Island Music & Arts Festival; David Byrne announced a world tour; Dead & Company announced a tour; Kendrick Lamar, Sam Smith, U2 & more performing at this year’s Grammy Awards; Future to produce the remake of Super Fly; Tom Hardy’s 1999 mixtape emerged; RZA dropped a PETA ad; Mike D dropped insights on the upcoming Beastie Boys book; Brian Wilson’s high school-era failing grade in music was reversed; Yams Day ended early after fights broke out; Merriweather Post Pavilion roof collapsed; Offset from Migos apologized for homophobic lyric; Too Short sued for alleged sexual battery; former bassist for the Ataris Michael Davenport’s alleged telemarketing scam; Kodak Black arrested; and we remember the life & works of Fredo Santana & celebrate the life of Dolores O’Riordan of the Cranberries. As we continue onward, it is now our pleasure & privilege to present the following interviews, exclusives & insights from Delorean Gray, Loi Loi, They Might Be Giants, There’s Talk, Well Well Well, featuring guest selections by Pearl Charles & more—in no particular order.